Today the circle of friends gathered around our table enjoyed a feast of BBQ chicken, summer salad, corn on the cob with parsley butter, and a blueberry tart. We put together a dry rub for our chicken, and then each child received a zip top bag with a skinless chicken thigh in it. We added a dusting of the spices into the bag, and they were able to rub in the dry marinade while avoiding getting their hands tainted! After baking them in the oven until almost done, we spooned on some organic BBQ sauce. Our summer salad is a remake of the traditional broccoli and raisin salad we all have seen at a pot luck. That recipe is normally made with mayo and bacon. I cleaned it up by replacing the mayo with plain Greek yogurt and substituting smoked almonds in place of the bacon giving it a similar taste without the bad fat. I typically do not put raisins in mine, but rather small chunks of sharp cheddar cheese. In a large bowl, combine the yogurt, vinegar, honey and S&P. Place the broccoli, cheese, and onion into the bowl. Toss to coat. Refrigerate for a couple of hours, and stir in almonds before serving. 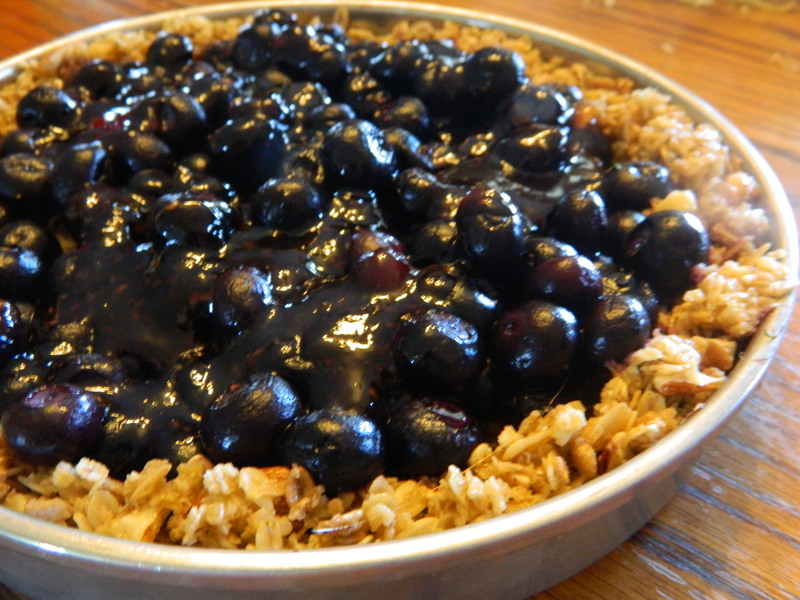 Our blueberry tart was a granola crust, blueberries, and a jelly glaze. Combine granola, butter, and nuts into a bowl. Mix until well combined. Press into an 8″ tart pan (or pie plate). Bake in a 350 degree oven for about 15 minutes. Allow to cool completely. Place blueberries into tart crust. Bring the jelly to a slow boil on the stove. Slowly pour over berries and place tart into refrigerator to allow to set- about an hour.